Sensitive teeth are often caused by cavities or gum recession. This recession of the gum line allows the underlying cementum to show through, which allows water and food easier access to the sensitive nerve. If you have sensitive teeth, be sure to tell us at your next appointment so that we can evaluate the cause. While regular dental visits are important to keeping your mouth its healthiest, great tooth and gum care at home are essential. Brushing for two minutes, twice a day and flossing on a daily basis is the best way to take care of your teeth and gums. By keeping to a daily routine you will greatly minimize the risk of gingivitis or tooth decay as you age. Gingivitis is a condition caused when bacteria surround the teeth around the gums. The gums can become irritated, inflamed and often bleed. In order to prevent the condition from worsening, regular hygiene visits are highly recommended. During your visit, our Hygiene team will teach you the proper flossing techniques and oral hygiene protocol for home care. Healthy gums shouldn’t bleed – as your home care improves & you maintain regular dental visits, gingivitis can be cured. Silver fillings, known as amalgam, have been around for decades. They are made from a metal alloy and were, for a long time, the best restoration for fillings. White fillings, also known as composites, are made of plastic or glass polymers. The restoration is made of a resin material and fits tightly into a tooth to prevent decay. Rather than a gray or silver material in your mouth, the composite color will match the tooth color & often times results in removing less healthy tooth structure as compared to placing an amalgam filling. With all of the discussion over BPA in the news, we do have a certified BPA-free material available. Please feel free to ask us if you have any questions about the various dental materials available for your treatment. Tooth wear is a dental condition where the surface and structure of teeth are progressively reduced by internal or external forces placed upon them. This can be due to acid, aggressive brushing, unfavorable forces on the tooth, grinding or clenching habits. If the outer surface of the tooth is worn away, the dentin can be exposed causing discomfort or eventual loss of the teeth. Tooth whitening is a cost effective and safe procedure to create a beautiful, healthy smile. Over the years, flouride has been added to the whitening product. This reduces the risk of tooth and gum sensitivity. 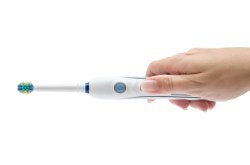 We offer customized take-home whitening products for daytime or nighttime use, as well as the Zoom! in-office whitening procedure. Tooth Whitening must be monitored by your dentist and only done after a comprehensive exam and hygiene cleaning to ensure the right whitening type and product are selected for your individual needs. Bonding is a cost effective procedure used to fill gaps in front teeth. The immediate results are amazing. Within a few hours, you will have a great smile! Bonding, like tooth whitening, may change color over time due to coffee, tea, cola and wine. Also, if you decide to whiten after bonding it is likely that the shades will not match as well as they did when the bonding was originally placed. Porcelain Veneers are thin pieces of porcelain that go directly on your natural teeth. This entire procedure can take as few as two visits. Veneers change the size, shape and color of a patient’s teeth. This procedure is used to repair fractured teeth, teeth darkened by age or medication, or a crooked smile. Many times, patients ask for porcelain veneers to simply feel and look younger with a straighter, more permanently whiter smile! A dental crown covers the entire tooth above the gum line and will change the size, color & shape of the tooth. This procedure generally takes 2 visits. A root canal may be necessary for a tooth with past trauma, a fractured tooth, or a tooth infected with large decay approaching the nerve. This procedure helps save the tooth by removing the nerve and restores it to its’ natural function. A bridge is used to replace missing teeth. It is a permanent restoration that is cemented in the mouth. It uses teeth on either side of the missing tooth for support. A bridge can be ceramic, metal, or ceramic covered metal. A bridge can take multiple appointments to complete the process resulting in optimal function and appearance. A dental implant is a “man-made” replacement for a missing or non-reparable tooth. 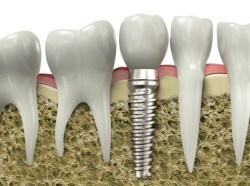 A titanium screw-like post is inserted in place of the tooth root. This process usually involves little, if any, discomfort. After allowing a few months for the bone to heal around the post, the implant is ready to have an abutment and crown placed on top of it to act like a natural tooth. Dental Implants are typically a more permanent, long-lasting solution for missing teeth. Dental Implants are maintained by routine hygiene visits to our office. Dental Implants replace the need for a removable full or partial denture, and can be used to help hold a denture in place when there is not enough bone to hold a denture on its own. Dental Implants focus only on the tooth or teeth that are missing. A traditional bridge would involve the two or more adjacent teeth being re-shaped to create a false tooth in between. The average dental implant procedure takes 5 – 6 visits. The first visit is to x-ray and evaluate the area, and to determine whether there is a need for a temporary tooth replacement while the implant is healing. The next visit is with a surgeon to plan for the implant, followed by an appointment to place the implant. A local anesthesia is applied to the area (any additional sedation is no longer necessary unless deemed by the surgeon). The surgeon will then make a minor incision to place the implant. The implant is placed into the jaw bone. The area will then be covered with sutures. The procedure is usually completed with little to no pain. 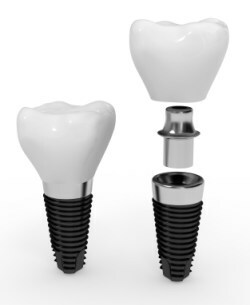 You will next return to our office in approximately 3 – 4 months to begin creating the crown and connector to place over the implant. Fees for Dental Implants vary from dentist to dentist. Always schedule an implant consultation to discuss the procedure and all fees involved. the healthy smile they deserve! Copyright © 2012 McCarthy Dental Group. All rights reserved.